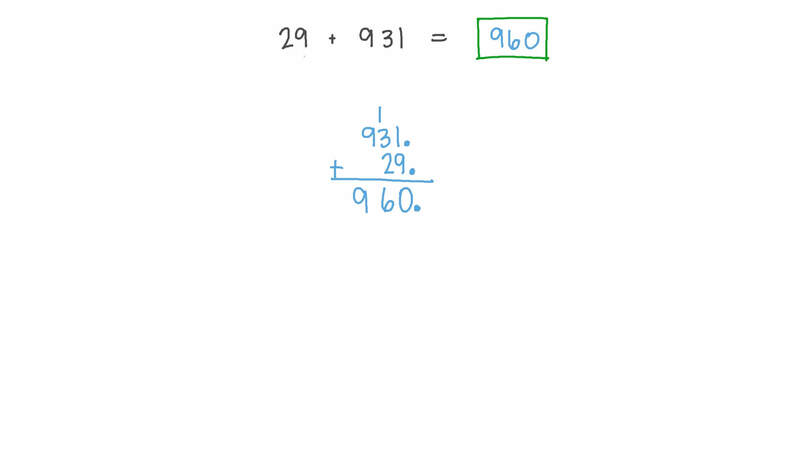 In this lesson, we will learn how to add multidigit numbers by adding the digits according to their place value starting from the ones and use this to solve word problems. 2 7 , 3 0 0 + 2 8 = . Find 4 1 , 0 0 0 + 4 5 6 . 1 7 , 3 3 2 + 4 7 , 9 1 3 = . 2 9 + 9 3 1 = . Find 4 5 , 2 5 7 + 1 , 0 0 1 . 4 1 , 4 5 3 + 4 , 7 3 6 = . Fill in the blank: 8 6 , 0 7 2 + 9 0 1 = . In a year, 13 665 flats were built in one governorate, and 12 556 flats were built in another governorate. How many flats were built in total? 46,292 letters were posted one month, and the next month 40,535 letters were posted. Find the total number of letters posted in those two months. A man bought a flat for 58‎ ‎729 pounds, and his friend bought another flat for 32‎ ‎265 pounds. Calculate the total price of both flats. What is the result of 331 plus 124? 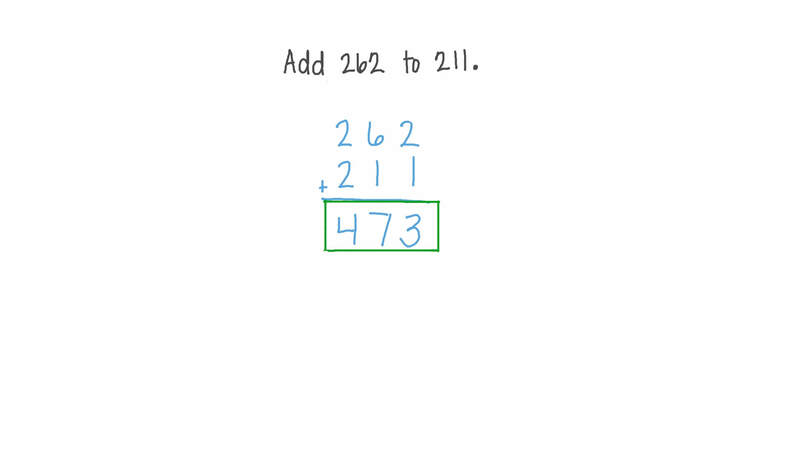 Fill in the blank: 7 , 7 5 3 + 2 2 = . 1 , 3 1 1 + 8 , 3 8 4 = . A ship sailed 3‎ ‎360 km to a port and then 2‎ ‎110 km to a second port. What is the total distance travelled? A mother elephant weighs 5,312 kg, and her baby weighs 1,414 kg. What is the total of their weights? 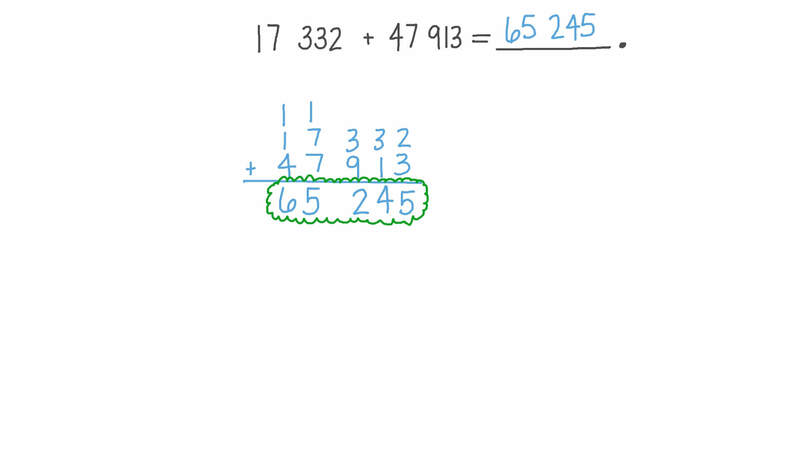 Find two consecutive numbers whose sum is 4 627. Find the missing values in the table. Fill in the blank: . Calculate 2 , 7 5 8 + 9 9 9 . In a year, a factory produced 140 thousand tons of fertiliser, in the next year, they produced 994 thousand tons of fertiliser. Find the total production of fertiliser over these two years. Complete the expression: 3 1 , 7 0 4 = + 7 0 4 . What number is missing? 6 0 + 7 4 3 1 + = 7 5 3 1 . 7 5 7 9 + = 7 7 7 9 .